I sat in the front seat of the helicopter, looking back over my shoulder at my colleagues, describing their motions to our pilot who was focused on maintaining the machine in a steady hover a few feet above the treacherous mountain peak. “She is opening the door.” “She has one foot on the skid.” “She is lowering herself onto the ground.” Seconds later, they were both safely on the ground, with all our gear. My turn. I took off my headset and carefully made my way out of the helicopter as well, onto the unstable rocks beneath, and over to my colleagues. The three of us huddled together, crouched low to avoid the rotor wings, in the line of sight of our pilot. We made eye contact with him, gave him the thumbs up, and he took off. Sandra, Navi and I did this hundreds of times this past summer, but even on the hundredth time, we stared in awe as the helicopter deafeningly dive-bombed down the mountain flank to gain some lift, and sped off gracefully into the distance. the side of a mountain after dropping off her and her crew. In my experience, there is no better way to bond with your teammates than to jump out of a helicopter onto a precarious mountaintop together. You must remain calm, cool and collected during such an adrenaline rush, and must communicate impeccably with no more than eye contact and hand gestures. And when you are part of such an amazing team, you want to go on adventures together. Indeed, the 2017 field crew may have wrapped up the season in August, but Sandra, Navi and I haven’t had enough of each other. 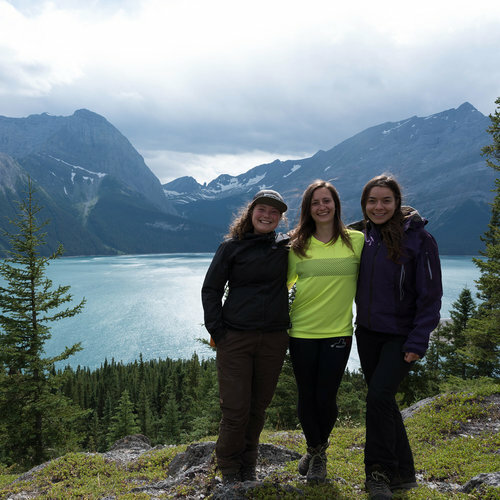 We met up in November for a hike in Victoria, and again in December to ski in and spend the night in Yoho National Park. We got to catch up, spend some time outside, and reminisce over the amazing summer we had. There were lots of stations (74), lots of repeat photographs (652), lots of helicopter flights, games of crib and new friends. The one worry that has come out of our time working together on the Mountain Legacy Project is that we have peaked too soon. No experience we will ever have in our lifetimes will measure up. That is not to say the summer did not have its ups and downs. The weather was largely uncooperative: BC wildfires blew smoke all over Alberta for weeks, limiting our ability to take good photos. Some stations were scary. Some days were stressful. Some nights we didn’t sleep as well or as long as we wanted. Some mornings we couldn’t have Fruit Loops for breakfast. But all in all, we had to pat ourselves on the back for every decision that eventually led us to working with the MLP together this summer. It was a privilege to fly with extraordinary pilots, to spend our days hiking in the Canadian Rocky Mountains, and to peer into the past through the historic photographs we were setting out to recapture. 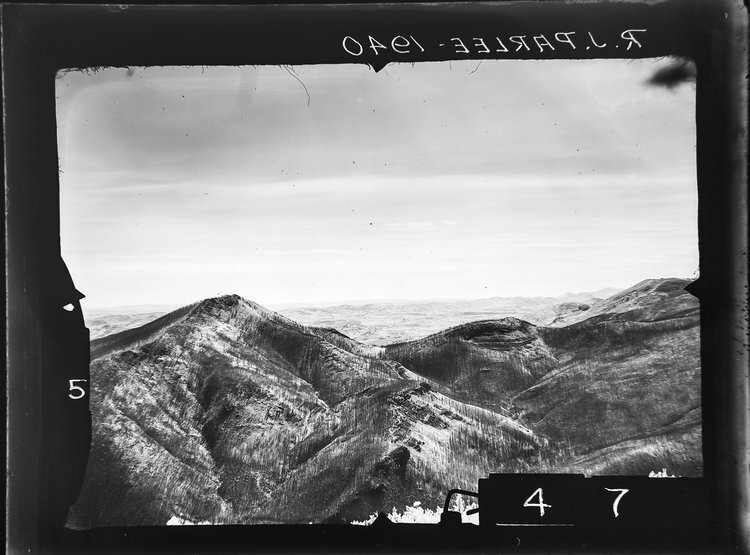 Paying such close attention to the landscapes as we lined up the images with our viewfinders made us mindful of what has – and has not – changed over the past several decades. This summer, we focused mainly on surveys uncovered by MLP researchers during a trip to Library and Archives Canada/Bibliothèque et Archives Canada in February of 2017. We spent a lot of time working with images from Parlee (1940), Dingle (1940) and Duvernet (1938-39), among others. As the days passed, we got to know these surveyors, their quirks and their habits. Good ol’ Dingle always had his camera set up exactly over the cairn. Nidd set up the tripod quite low to the ground, making you squat while you try to line up the pictures. Parlee had a mix of high and low elevation stations in his survey, which gave us many options to work with when the winds picked up and made the high elevation stations too dangerous. This photo was taken by R. J. Parlee in 1940, west of High River, Alberta. The Mountain Legacy Project team re-captured this image on July 7, 2017. Although our meet-ups in November and December (unfortunately) didn’t involve any repeat photography or helicopter hover exits, Sandra, Navi and I continue to be thankful for having had the opportunity to work together. 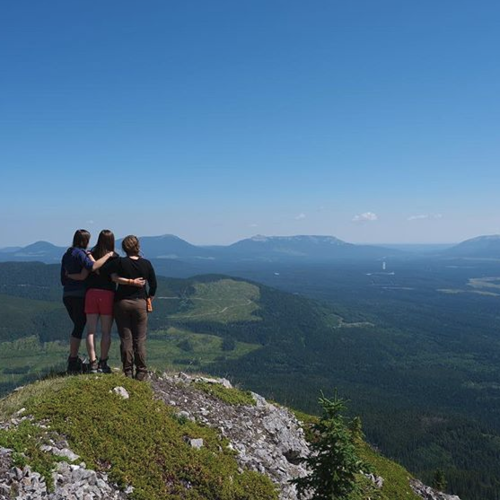 We also hang on to the hope that some day, the three of us will be back in action, huddled over our bags on some mountain while a helicopter dive-bombs away from us. We are extremely grateful for all the support Alberta Agriculture and Forestry has given the MLP over the years, and we think that this work – documenting these changing landscapes – is enormously important. We are so grateful to Rick Arthur or Eric Higgs for making this happen year after year, Mary Sanseverino for always sharing her wisdom with us, and Karson Sudlow and Sho Ya Voorthuyzen for joining us for two great weeks and helping out with so many behind-the-scenes aspects of the project. Cheers to another outstanding field season!